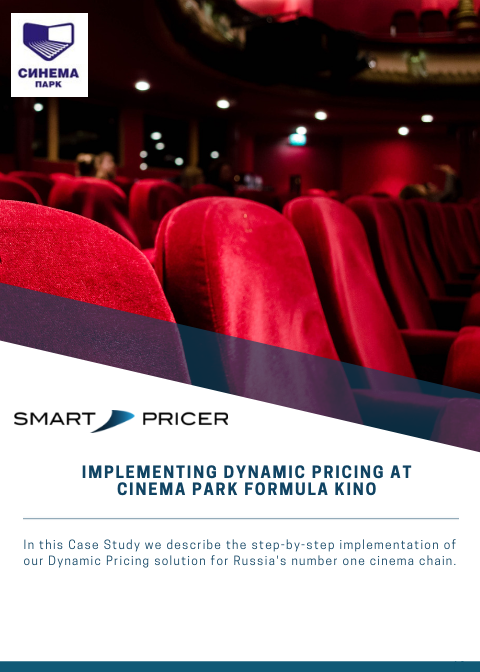 In this Case Study we describe the step-by-step implementation of our Dynamic Pricing solution for Russia’s number one cinema chain, Cinema Park. Many graphics and pictures help to understand the different phases for a correct implementation. Learn about the success of our solutions by downloading this Case Study. Cinema Park Formula Kino is Russia’s number 1 cinema chain. We have analyzed their ticketing data and integrated our pricing software into the ticketing system to achieve an overall average ticket price growth. The project was structured into three main steps in whiich we implemented our price optimization solution at their sites in Russia. The new pricing strategy aims to reflect the real-time demand to utilize the ticket price potential for each show. Firstly, by increasing demand for off-peak shows and utilize high-peak shows. Secondly, by incentivize online sales with attractive prices. Thirdly, by calculating the optimal ticket price for each show at every time.